WR Mike Evans vs. CB Patrick Peterson– This week’s game features one of the highest profile wide receiver-cornerback matchups of the season. Cardinals’ cornerback Patrick Peterson has been a player for offenses to avoid so far this season. 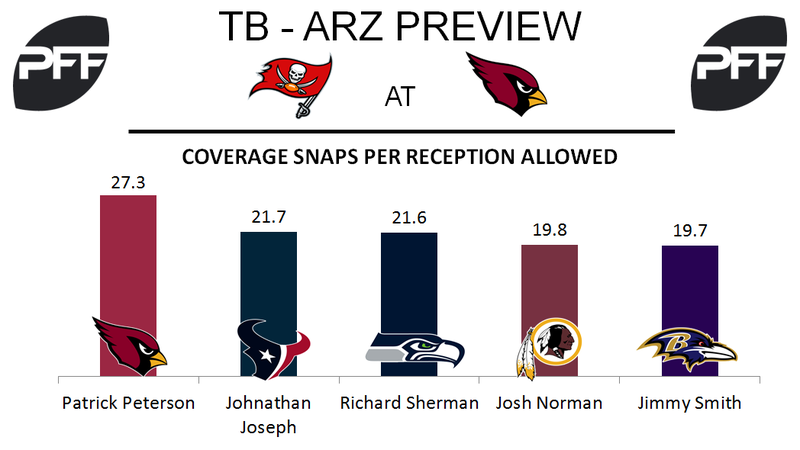 Peterson has allowed a reception once every 27.3 snaps in coverage, which is not only ranked first in the NFL (minimum 100 snaps) but also nearly six more snaps per reception allowed than the next closest cornerback. Even when he allows a reception, he does not allow the catch to go for many yards, as he has allowed just 82 yards while in coverage which is the fifth fewest in the league. Buccaneers wide receiver Mike Evans certainly presents one of the most difficult challenges for Peterson as Evans is one of the premiere receivers in the NFL. Evans has been held in check somewhat so far this season, but still ranks 19th in overall grade among wide receivers with a grade of 79.6. HB Doug Martin vs. LB Karlos Dansby– After serving a suspension for the first three games of the season, half back Doug Martin provided a spark to the Buccaneers running game last week by totaling 74 yards and a score on 13 carries. Martin forced three total missed tackles last week, which was good for an elusive rating of 69.2. Cardinals’ linebacker Karlos Dansby will be tasked with slowing Martin down this week. Now in his 14th season in the NFL, Dansby has been a solid run defender so far this season. Through five games, Dansby ranks 16th out of 55 qualified inside linebackers in run-stop percentage at 9.8 percent. T Donovan Smith vs. Edge Chandler Jones – Buccaneers’ left tackle Donovan Smith has had an up and down 2017 season. He has struggled in run blocking, which has resulted in a run-block grade of 35.6. However, the former second-round pick has performed better as a pass blocker, as he ranks 32nd out of 69 qualified offensive tackles in pass-blocking efficiency with a rating of 94.5. This week, Smith will be matched up mostly against one of the league’s best pass-rushers, Chandler Jones. Jones signed a lucrative contract this past offseason and has done a good job of living up to high expectations. Thus far, Jones ranks tied for 16th out of 105 qualified edge defenders in overall grade with a grade of 83.4. 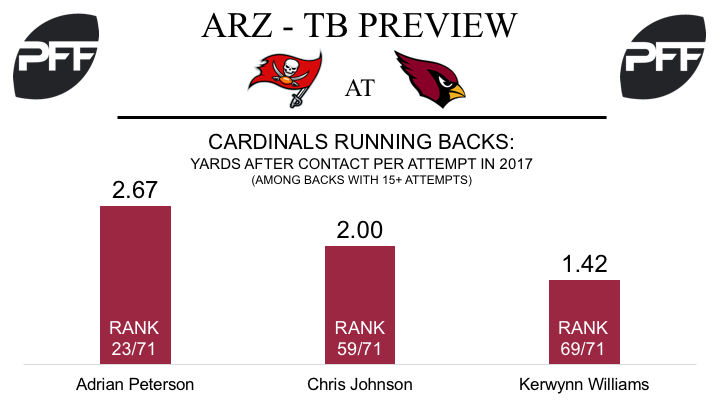 HB Adrian Peterson vs. LB Kendell Beckwith – The former MVP was acquired via trade on Tuesday and was immediately thrust atop of the Cardinals’ depth chart. The 11th year running back will instantly give the team yards after contact, yards that were previously missing before his arrival. Peterson rushed the ball 27 times this year in New Orleans, and averaged of 2.67 yards after contact per attempt, which ranks 23rd among 70 backs with at least 15 carries and comfortably beats the averages of his teammates. In his first game as a Cardinal, he’ll be looking to avoid rookie linebacker Kendell Beckwith, who has more run stops (12) than any other rookie linebacker and currently ranks sixth among all inside linebackers with a run-stop percentage of 12.6 percent. G Evan Boehm vs. DI Gerald McCoy – Through five games of the 2017 season, Evan Boehm has allowed 15 total quarterback pressures on his 247 pass-blocking snaps and currently ranks 40th of 51 guards with a poor pass-blocking efficiency of 95.2. It’s imperative that he cleans up his act in pass protection going forward, but that’s easier said than done when he faces Gerald McCoy this week. McCoy has been a menace in the pass-rush so far this season, tallying 18 pressures and producing a pass-rush productivity of 9.6, both good for fourth best among defensive tackles. QB Carson Palmer vs. the Pass-Rush – The Cardinals offensive line has been truly disastrous through five games of the season, and a 37-year-old Carson Palmer is struggling to produce under the pressure that’s constantly allowed. After five weeks, the Cardinals line has allowed 102 total pressures, 17 more than the next closest unit, and they’re on pace to allow 326 total pressures, which would comfortably be the most ever allowed in the PFF era. Palmer has been under pressure on 42.9 percent of his drop backs this year, and has posted a passer rating of just 57.5 on throws while under pressure. The team will really need to dig deep against the likes of DIs Gerald McCoy (9.6), Clinton McDonald (8.0) and Edge Robert Ayers (10.2), all of whom have posted top-15 pass-rush productivity ratings among their respective position groups so far this year.